You not only have set out on a journey to carve yourself out as an authority online, you have the underpinnings and structure set up for a long term and very successful business online. Wealthy Affiliate is a platform and community that you can believe in and your income from WA alone, could drive you to a FULL TIME INCOME and far beyond. That is our ultimate goal with the Bootcamp training and that is exactly what you are going to accomplish if you give yourself time to achieve success. That leads me to "what success looks" like online. I want to give you some true perspective before I leave you today. There is an old Chinese proverb, and one that has always remained very close to me in my journey online, as well as when helping others build successful businesses online. In other words, if you want to know what success looks like and what the journey is like, then ask someone who has been there. I have been at this full time since 2002 and I think that I can offer you an incredible amount of insight into what the journey to success will like look. But it is not just me, you have an incredible community of help and literally 100,000's of folks that "know the road ahead". We are truly a pay it forward community, and one where we all have each others best interests at heart. I want to offer you some powerful insight here INTO the journey before we wrap things up in Phase 1 of Bootcamp here. I want to break the journey down into typical timeframes, based on consistent effort and work for you. When can YOU expect to achieve certain goals and success? Here is how your journey could look, a realistic journey. Search Engines are starting to give your site "authority"
**Note: It took me 3 months to make my first sale online. Here I am 15 years later full time online, if I quit in the first month I would have never gotten to experience of lifelong and very fruitful business online. There is something to be said about being patient and not expecting "instant" success in business. You are definitely a noticeable force in the search engine world. Google ranks your new content with 24 hours of it being posted. But remember, you are building a business here. You get OUT of your business what you put INTO it. Ask any successful person what the fundamental reason why they are successful and others are not and they will usually say one of two things. Hard Work or Focus. This is just the start of your brilliant journey into the online business world and through time, you are going to become an authority in this space. I feel it! If you have made it to this point, you already have the foundation of your business set-up and this is going to be instrumental to building out a long term and very successful business online. There is A LOT left to learn and a lot of technology and tools that are really going to benefit you and your business moving forward and EVERYTHING you need to reach any level of success online is going to be included in the Premium membership. It only takes a second to upgrade your membership and I promise you, if you like what you have seen up to this point, you are going to LOVE what is offered to you within Premium. There isn't a more comprehensive, technologically advanced platform in the Internet business industry than Wealthy Affiliate. Not to mention that we are by FAR the most cost efficient, offering you a Premium membership for less than $1 per day if you go yearly (which is offered to you when you become a monthly member). To move to Premium and unlock the next 6 Levels of Bootcamp, and get everything you need to operate your successful business (or MANY successful businesses), click the following link. Ultimately you have do what makes sense to you. If you want to create a long term business online, the costs are very nominal to doing so. If you want stay on the Starter membership, that is up to you as well. The second that you go Premium, you are also going to get DOUBLE THE COMMISSIONS! Premium members get $23.50 recurring for monthly referrals and for yearly, you are going to get $175 recurring. A single sale, over time, can add up to several $1,000's and that is the beautiful part about recurring commissions. As a Premium member you are also going to get affiliate credit for all domains that your referrals sale, as well as well a $1 credit for all referrals that end up setting their profile image/description up. These can add up and you can use them here for things like SiteDomains, SiteComments, SiteFeedback, or cash them out for real cash. Next step, Phase 2 Training. We are just getting rolling here. You have your website set-up, you have a solid base of content, and your knowledge and skillsets are progressing very quickly. This all happened within just ONE phase of the training, as you move through the subsequent phases of the training your are going to see your business truly take shape. 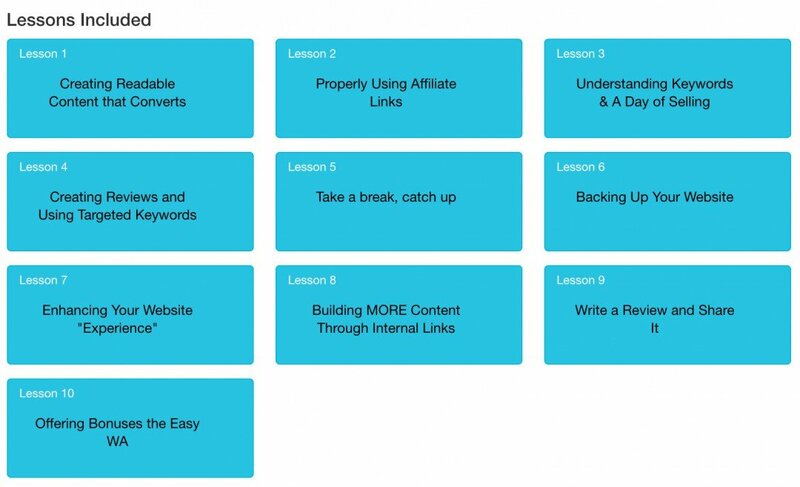 By the time you are done Phase 2 training, you are going to be well versed in keyword research, building out high quality content, getting rankings in Google and other search engines (and for free) and how to build up a significant base of traffic on your website. Exciting stuff truly lies ahead! When you are done taking a bit of a breather, you can move right into the next phase, ACCESS PHASE 2 HERE! 1. Reward yourself for your hard work thus far! Yeah, every theme will behave a little bit differently. Don't worry, you will be able to organize your menus with "custom menus". You know, I had to do my steps as I watched the videos, If I had a Hangup all I had to do was rewind the lesson a watch where I had that hiccup. After that and utilizing the lessons as I learned them, it wasn't so hard. I prayed for God to help me to understand anything that has to do with the internet because I am a newbie at this. I thank the Lord and Kyle and everyone who has been helping me. You can tell they actually care if you succeed or not. For this, I am truly thankful. I wish the best to everyone desiring to continue their journey with Wealthy Affiliate. I find it hard to choose a niche that I will be able to successfully promote WA from. My problem is equating a niche with promoting how to make money online. If I were reading a website about health for example I would not necessarily click on an ad to WA or any other ad for making money. You might click on a WA Ad if it was enticing enough. Curiosity could get the better of you lol. Whatever your Niche you will be promoting products related to that Niche and a WA Ad is an afterthought. You could also have a post dedicated to promoting WA whatever your Niche. Hi, I currently have a WordPress website superleadbrand, that I haven't really done anything with yet, basically because I don't really know what i'm doing. At the time i started setting it up I had the idea of creating a website for helping others, who like myself struggle to get leads, hence the name superleadbrand. I got as far as installing the astra theme plug-in to help build my site out. 1. Do you guys think this is a good niche/path to take? 2. Would I be able to transfer my domain name to my WA website or should I leave it as it is and just get on with building it? Thanks for any feedback, sorry this is a bit of an essay for some to read. As a newbie in marketing, I think I should go with an idea and motivation on my site, why I came to this community. My idea to create a blog , where I write articles about career change possibilities in ones 30’s or 40’s, also how important is to have at least basic skills of online marketing for each of us, so we could promote our hobbes or professional skills. They say , the skies the limit and that's where I'm headed ! I did quite well in my last career and had a comfortable lifestyle ! Now I'm headed in a different direction ,but if I get to where I want to be , " which is as a success " in this new venture , then a lot of other people will have joined me on this exciting journey and they will also hopefully be tasting success , I intend going out there and making other people aware , of what an amazing opportunity we all we have here at WA . If I can reach my goals , then I'll be at that Las Vegas Conference 2020 ! Awesome Stuart, the sky is the limit within the online world and the audience you have to build a business off of is literally 4 BILLION people. Something that we have never experienced in our lifetime, and one that only continues to grow. From the looks of things I will need some help. I want to be promoting WA as an affiliate - focussing on middle income earners in any part of the world. I also want to engage the army of unemployed graduates in many African countries with the aim of getting on to WA affiliate programme. How do I build a website that will address these two groups or would I need to build one site for each niche. If you are thinking of promoting WA to a range of audiences, you only need one website. Let your posts on the website dictate the audience through your keywords. I'm a performer. I came to Wealthy Affiliate to help find new avenue to make money and follow my dreams. I want to follow that niche and help others like myself. I see my friends struggling to get by when I know that something like this would be the answer to their prayers. Do you think it would be too broad for me to find my niche in Performers or Artists? wow... this is huge brother, go for it. i don't know what kind of artistry you practice, but i am into music so i totally understand the struggle. The thing is, a lot of artists out there are trapped in the old way or methods with guards to how they promote their art. i often like to say "it takes an artist to identify the struggles of artists". Your train of thought is very right my brother. it is a very big niche. It's a niche i want to give back to down the road in my career online. Yes it is a very broad niche. if i were you, i'll pretty much narrow it dawn to my specific genre of art then gradually spread to other related areas of interest once I've built authority. This is quite consistent with WA's style of training and it is one of the many things that makes this platform thick. A perfect training system that fits everything. Once again, GO FOR IT! YOU WILL MAKE IT! It's a very good idea. Follow the training closely. I am sure that with your determination, you will achieve that purpose. You are obviously passionate about your Arts and very caring about your friends , so I feel sure that same passion , will shine through , if you use it as your niche . I feel certain it will work for you and help , in the building your dreams, in this your chosen path . if you don't try it , you will always wonder if it might have worked ! So If it doesn't work out , at least you tried and gave it a good shot and who knows it just could be a real runaway success .. I am living in a country where 80%+ of people are living below the poverty threshold because of various contributing factors, one of which is corruption by government officials, so to speak. Unemployment and underemployment in my country is in a magnitude level where many of my countrymen, in order to survive scattered around the globe as domestic helpers. Statistics would show that my country, Philippines is one of the top supplier of domestic helpers in the world. I'm my desire to help, what do you think is the best Brand Direction I should focus to? We have similar story. Because of that, one of my cardinal objectives is to help build great affiliate marketers in my country and use part of my earning here to help as much as I can. You can follow me. We may be sharing ideas along the line. Thank you. I am following you already. I would like to create a website dedicated to mental health. Still in 2019 it is not fully understood. I am not a mental health professional however I would like to create an environment to let people know they are not alone and feel motivated to continue on. The idea is not to provide diagnosis or to be a source of medical information. I would instead like to create a place where people suffering from mental health problems can go to, to see that they are not weird and maybe just maybe feel some positivity. Any suggestions/constructive criticism would be gratefully received. One suggestion is that you should have an open mind. Mental health is big and broad than people ordinarily take it to be. I want to help people achieve their online goals. I know many people dream of success, but few experience or achieve the level of success they desire. I want to be a part of that equation. A part of something greater than my own goals and personal desires. What would be better then helping someone else realize their dreams? You are such a rare gem in this days of pursuit of selfish interest. Best of luck to you. A noble gesture my friend , there is so much self satisfaction to be had , when you mentor someone , then see them grow in confidence and ability and finally start to achieve their own ambitions and success . Some however will fail and fall short , so a big part of the equation is to not give up on them , but push them forward , till they also "Get it" . My thought process is that as soon people start preparing for retirement or even think about retirement, the "I wonder if we can afford to go on that cruise" or "Can we afford to fly the grandchildren up to visit now"...thoughts ensue. "Retiree and Wealthy Affiliate" An oxymoron that may draw the people I'm targeting...What do you think? I like the idea of targeting retirees because WA is a great way for them to earn extra income! Well done! Till now everything went well all along the Process of Building my Online Business. And I expecting that to continue. But honestly I am scary about this issue of content ahead of me. Whatever, just one thing I will keep doing: remain confident and focused. Thank you to WA Team and the whole Community. Your content is fine, I can tell you that right now. If you can write comments like this, you can write engaging articles. I have two targets. And I'm wondering which one is better. The First target audience would be " earning money when studying ", which is for the college students. The second one is " earn money online when traveling". The reason why I choose this is that it's actually the job what I'm pursuing. Moreover, I'd like to turn it into a long term business. However, I'm not sure which one would be better. Can someone give me some advice about that?? Thanks!! Kyle~　I did some keywords research for the two targets and found that the college one has keywords with more traffic and lower competition. Is it better to focus on that target audience? my brand is targeting entrepreneurs to build a passive income. Wonder how quickly can I launch this brand? Is there a standard blog to use it to launch WA? I know this requires some persuasive writing skill. But I have no skill in creative writing, wonder if there is standard model to follow? You can launch this brand right away, establishing your brand will take more time. If you give yourself a year with effort, you can be in really good shape and have established authority in any niche (including within the passive income niche). Thank you Kyle, would like to use my first 2 website to launch WA . Can you show me the how to? - People Who Vacation Lots (like the freedom) and alike who may benefit from WA training. How to put it properly? Is it too big of a group and should be narrowed? Or otherwise? Is there enough potential? Sure, that is definitely the direction that you can head. SEO is Search Engine Optimization, meaning that you get ranked in Google and other search engines (Yahoo and Bing) for free...but this is based on how you optimize your website and content. This is going to be the primary focus in the early stages of the training. Who specifically do you want to help, as in the type of people that you want to help? Everyone wants MORE money so that is not really a niche. Your target audience/niche can be anything. Choosing your niche, is in essence choosing an audience that you want to help. If you want to come up with some ideas for your bootcamp website, you should check out the following tutorial. Target Audiences for Wealthy Affiliate There are many directions that you can head and many ways in which you will be able to efficiently promote Wealthy Affiliate to different audiences. I really think you have done a fine job here. I recommend that you use more visuals within your content. Most people are visual by nature and when you create content, you should have associated images that reflect what you are talking about.